Its’s been increasingly difficult to find birthday and Christmas presents that my Mum would appreciate as she’s grown older and frailer, but last year I had a brainwave. I would knit her a cardigan, letting her choose the wool and the pattern so that she would have exactly what she wanted. She had the added bonus of watching her present evolve and having it made to measure too. It was a great success and so I decided to do it again this year. I picked out a number of possible patterns – that I would be happy to knit and I was confident she would like for my mum to go through. 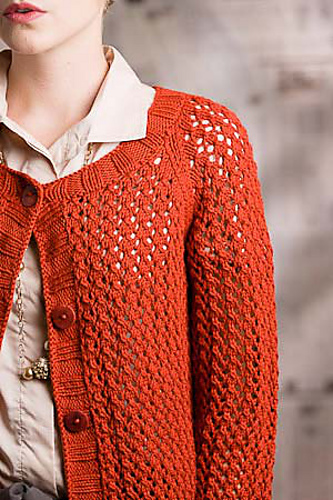 She picked Debbie O’Neill’s Belvedere Cardigan from a back issue of Knitscene. It was a pattern I liked and was curious to knit, but not something I’d wear, and it was something a little different to anything in her wardrobe. Then we looked at a couple of shadecards and she picked out a rich olive green. The yarn is Wendy Mode DK, a good, practical blend of wool and acrylic, that looks nice and can be safely flung in the washing machine when necessary. The pattern was straightforward: an easy to remember lace pattern – a six stitch repeat over 4 rows – and simple shaping that made it easy to adapt to knit in one piece. I did the bulk of the knitting at home but I did take it along when I went to see her in her nursing home. This year she still enjoyed watching the progress of her cardigan and she liked the attention as a few other residents and one or two of the staff took an interest. I finished knitting last week and found the right buttons at the weekend. The light wasn’t great for taking pictures, but I forgot to take them until tonight and my mum’s birthday is tomorrow. So now it’s wrapped and ready to go, and I’m hoping that my mother enjoys her first birthday in her new home. What a kind, thoughtful daughter you are! That is a really lovely idea. It’s gorgeous! I’m sure she’ll love it. I love that colour and the stitch pattern looks really nice. I am sure she will love it. What a nice gift! Jane, what a lovely idea, giving her the fun of picking out the pattern & color, and then of watching her present grow. Such a rich colour, it’s gorgeous! What a great idea for a birthday gift! So thoughtful and full of love. I do adore the color and the pattern of the cardigan. Beautiful! What a nice tradition you’ve created! I know how hard it is when our parents become frail … I know she’ll feel wrapped in your love when she wears it. 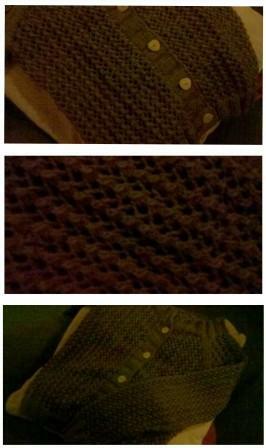 I love the pattern and even though the pictures are dark it turned out lovely!! She will absolutely enjoy it!! You’re so thoughtful and talented!! A wonderful gift for no doubt a wonderful mum. I am sure she will beam with pride every time she wears it. There is nothing like a gift made with love!! That’s a beautiful, thoughtful gift. I do hope your mum likes it. Happy Birthday to your mother! That is a beautiful cardigan. and I am sure she will enjoy wearing it.